The North Iowa Bloggers were provided free pizzas by Kum and Go, Casey’s and Godfather’s to facilitate this taste testing. All of the views and opinions shared are honest and 100% my own. I billed the event as “epic” and I think it lived up to the hype. 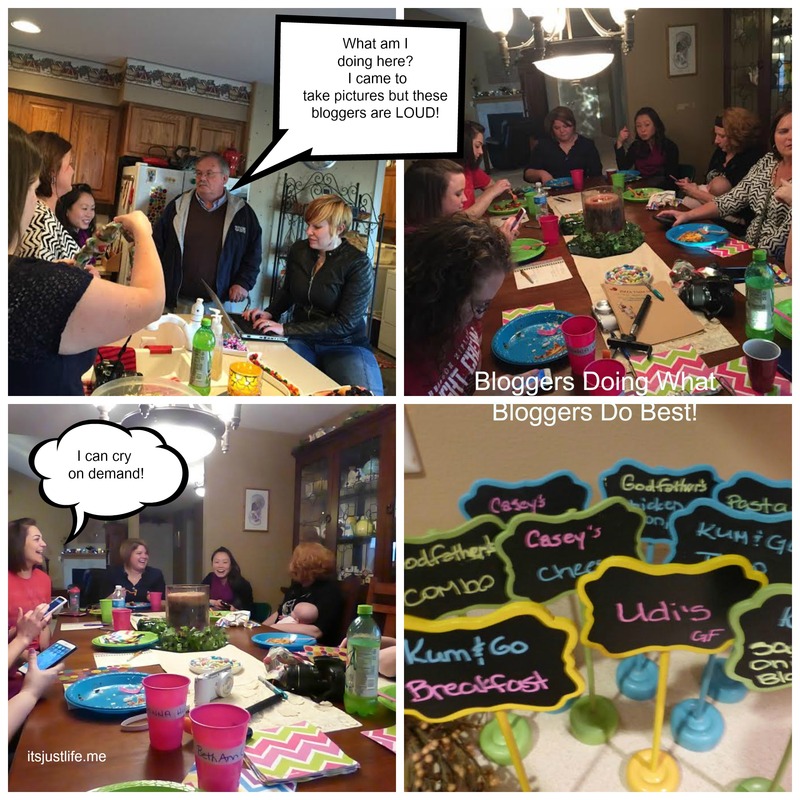 As you know the North Iowa Bloggers are always up for a fun time and a challenge. Remember the Oreo’s taste test and the Lay’s Potato Chip Party? To say that we enjoy a food challenge is an understatement. This story began, once again, on Twitter. There was some discussion among the group members about gas station/convenience store pizza in Iowa and how great Casey’s pizza is. I have never sampled it so I tweeted to Casey’s and simply asked what was the best kind to sample first. Imagine my surprise when Kum and Go (yes–we have gas stations with that name in Iowa) responded to my tweet and answered that THEY had good pizza as well. After awhile Casey’s replied and the whole exchange began unfolding. Katy from Learning As I Go and I put our heads together and decided this was a perfect “event” for the bloggers so we messaged several different pizza places to ask if they would donate pizzas for a tasting party. Casey’s, Kum and Go and Godfather’s (thanks to the local manager of the Mason City Godfather’s) all said that they were in and so we started planning. I hosted the event and we had a lot of bloggers, including several new to our group, attend and sample the pizzas. Not only did we have the 3 donated brands –we also enjoyed a local restaurant’s offering thanks to Jeni of JeniEats picking up and donating a lovely Margherita pizza from Pasta Bella. Donna of DonnaHup.com also contributed a gluten free Udi’s pizza. We had a total of 9 pizzas to sample and sample we did! To add to the confusion excitement the local paper, The Globe Gazette, wanted to have a reporter and photographer stop by to talk to the bloggers about what we do and who we are. We had invited them to stop in and they most likely were a bit overwhelmed with our exuberance and happiness at just being together. I am anxious to see what the reporter was able to get from our scattered and loud conversations. 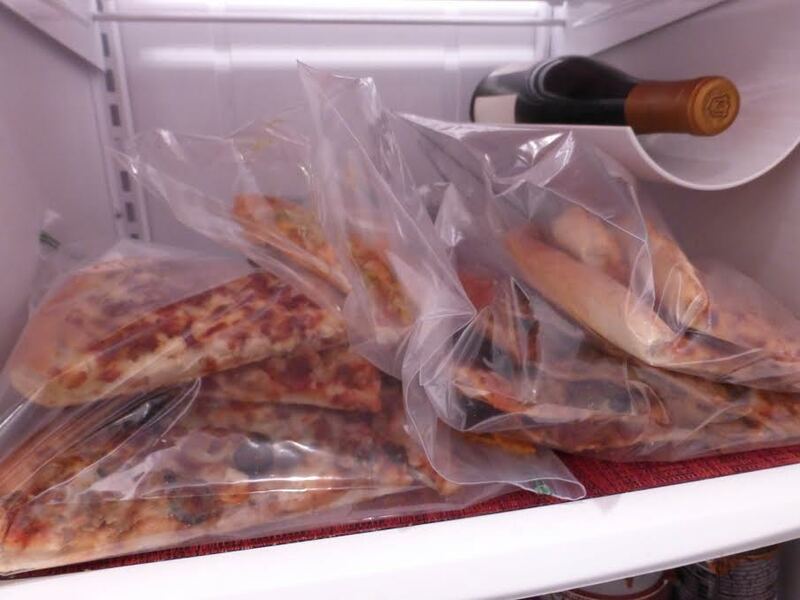 I did make sure they had ziplock filled with pizza when they left so at least I did that, right? The tasting was probably not very scientific and because all the pizzas were so totally different it was hard to really compare them to each other so I just gave up and decided to not compare but just choose the one that I liked the best. I did not sample all of them—I think I missed 3 but I did sample one of each brand so at least that worked. Some of the gals took notes. They took the voting thing way more seriously than I did, I guess, or maybe it was because I was just trying to be hostess, hold Val’s (of Corn Beans Pigs and Kids) baby and eat at the same time. Regardless. 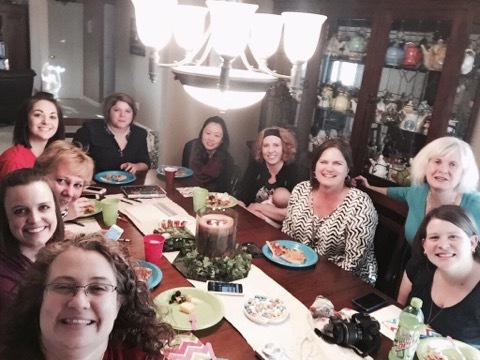 let me tell you, there was a lot of laughing and giggling involved and it was wonderful to have everyone there gathered around my table. Of course we were missing quite a few from our group and especially missing our Amy but it was a great time of catching up, sharing our lives and continuing to share our grief over the death of one of our bloggers. She was present with us in many ways and always will be. I kept thinking how she would have loved this party. She would have had her selfie stick and she would have been photobombing pictures. She would have been taking the angled shots of the food and putting the rest of us to shame with our attempts at documenting the night with pictures. Every time we have an event we will be remembering her and missing her. 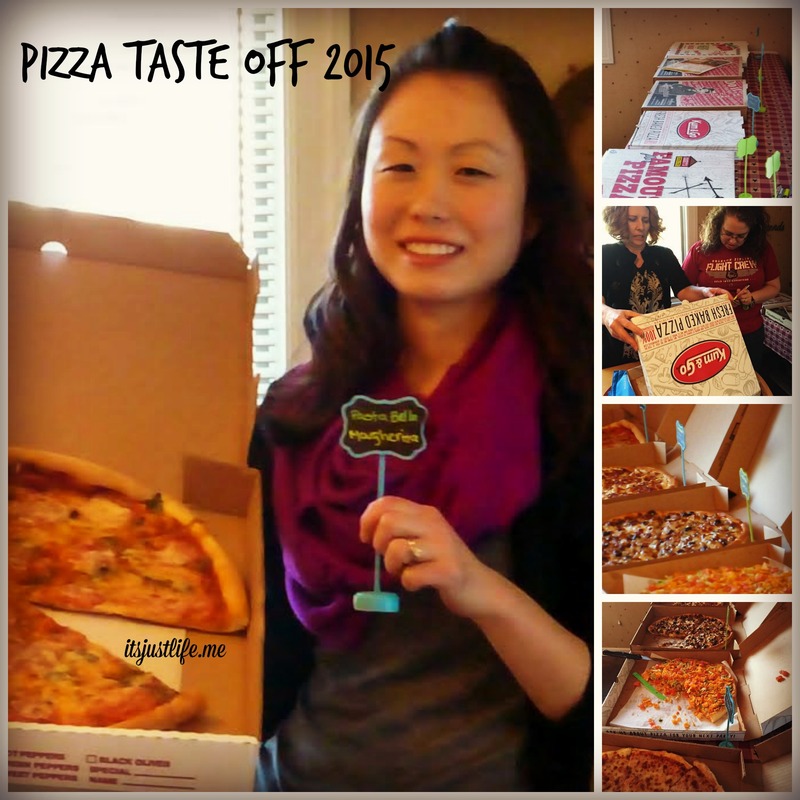 I could not end this blog post without telling you which pizza won, right? It was neck and neck but the first place winner was the Pasta Bella Margherita Pizza with Kum and Go’s Breakfast Pizza coming in a close second. Guess what? They were the two I chose so I guess I had good company. The Pasta Bella selection was light and flavorful–filled with the yummy goodness of basil and tomato with just the right thickness of crust to complete the taste sensation. 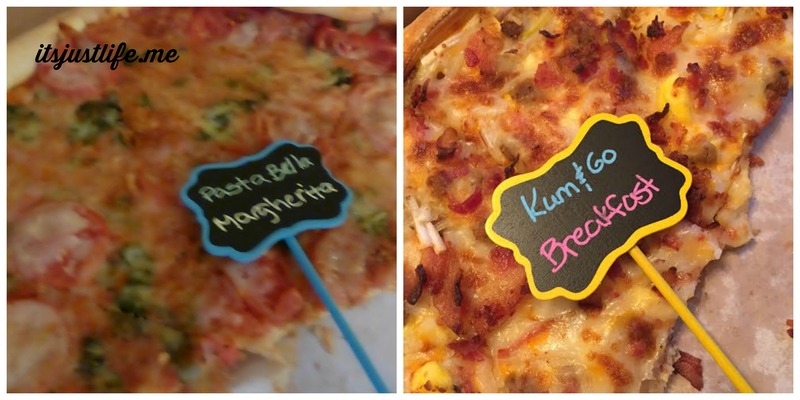 The Kum and Go Breakfast Pizza was simply fabulous —I especially loved the hash brown addition to it that I have not seen on other breakfast pizzas. I want to dispel any thoughts that we only feasted on pizza. We also had some yummy salads to go with including an Overnight Salad from Val which you can find the recipe for by clicking here. So now – if it were up to you—what kind of pizza would you have? Did I mention that despite the fact I sent pizza home with everyone in doggie bags I still have tons left? Pizza, anyone? PizzaTasteOff results from Beth Ann Chiles on Vimeo. If I lived closer I would be there (for breakfast– cold pizza…..yum) in a heartbeat!!!! I’m sure the reporters are still recovering from their “excitement overload”!!!! LOL! Great post!!! (and, yes, bittersweet. I didn’t know Amy but, for some reason, thoughts of her and that day haunt me……along with a couple of very recent tragedies in our circle of friends………………..). Thanks, Doreen. You would fit right in with this group -let me tell you! I still have pizza in the fridge that is getting stuck in the freezer before I leave for Alabama. It will make a nice snack later! 🙂 Bittersweet it was indeed. I did see news of some sadness around your area as well. Hard to take it all in sometimes. Hugs coming your way. Thank you so much…..hugs needed for so many!!!!!! I agree. Prayers and hugs coming your way. Dear Doreen, I am unaware of the recent tragedies in your circle of friends. But prayers and hugs, my dear. Thank you………………….hugs back at ya..
What a great pizza party. I love pizza. My favorite is a thin crust pizza, Italian sausage to be specific, crafted by locally-grown the Signature Bar & Grill in historic downtown Faribault. I love thin crust as well and I think that is what I liked about the Pasta Bella pizza–just the right thickness or rather thinness! Great review and thanks again for hosting!! Hugs! Thanks for helping!! Especially with the “official announcement” video! You rock! I am always happy to host the bloggers. Always. Our group is growing but what fun and adventures lay ahead for us! What fun! I love pizza. And will forgo bragging about Chicago’s best ever pizza. Coming to Chicago in May and going to Lou Mainati’s with the North Iowa Bloggers!!!! Do they have pizza??? So much fun! Thanks again for hosting! Absolutely! I love being able to host these events!